Bar manager Vanessa Coupar pours tequila with a verdita chaser at El Santo in New Westminster, British Columbia. Have you been to New Westminster lately? Realtors are calling it the Brooklyn of Vancouver – a SkyTrain-connected small town where cool kids with a hankering for home ownership can still afford heritage fixer-uppers and waterfront condominiums. Yet, for all the third-wave cafés, craft breweries and ciabatta sandwich shops that inevitably followed those cool kids, the city's main drag – Columbia Street, a.k.a. The Golden Mile – remains a slightly bizarre, blue-collar shopping district that continues to do a roaring trade in bridal gowns and industrial safety vests. Among all that poufy crinoline and DayGlo reflector tape, a modern Mexican restaurant has lately been giving the Paramount Gentlemen's Club a run for its money as anchor of the strip. The buzz has been building since El Santo opened at the end of 2015. More recently, it tied with La Mezcaleria to win best Latin restaurant at the Vancouver Magazine Restaurant Awards. Best Latin, in all of Metro Vancouver? Well that sounds worthy of a two-zone TransLink fare. But come on. Like so many boosterrific claims around gentrification, this gold-medal showing is actually somewhat of a compromise. Don't get me wrong. There is a lot to like about El Santo. If I were a cool kid living the life of a condo developer's glossy-brochure dream, I'd be pretty stoked about being able to saunter in on a Saturday night when a rotating roster of Latin musicians park themselves in the front window. Hey, doesn't this make El Santo even more cosmopolitan than most of downtown Vancouver, where live music in restaurants is few and far between? An extensive tequila and mezcal selection is pictured behind the bar at El Santo. And for a genre that is still largely defined by pinatas and sombreros, El Santo is definitely a fresh breath of sophistication. The restaurant has a bright, airy ambience – the kind Yelpers tend to call "Big City" – replete with high ceilings and polished concrete floors. Appointed in marigold and dusty teal, the spacious main dining room is tastefully layered in hand-stitched leatherette panelling, metal-mesh screens, hand-blown-glass cluster lighting and a commanding sculpture of a masked Mexican wrestler assembled from wine corks. It's cool. It's hip. You can squint your eyes and pretend you're in Yaletown. If you need help visualizing, the bar offers a huge selection of tequila and mezcal – more than 100 brands. You can order shots in flights or with a chaser of verdita, a zesty green juice pressed from mint, cilantro, lemon and pineapple, which makes the booze go down like healthy smoothies. The margaritas, made with squeezed-to-order lime and none of that nasty agave sweetener that has lately grown into a ubiquitous scourge, are excellent. The all-B.C. wine list is discerning. The setting is sharp. The service is snappy. There's nothing cheesy about it, including the menu, which is focused on local freshness and housemade goodness – and probably explains why the Vancouver Magazine judges were won over. "It's important to tell people that Mexican food is more than just tacos and enchiladas," says owner Alejandro Diaz, a former hotel-industry accountant, speaking by phone from Guadalajara, where he and his sous-chef were doing food and beverage recognizance while sourcing new parts for their handmade tortilla machine. "When I think Mexican, I think fresh." Carnitas de Pato dish, served in a cast-iron pan. As it is at El Santo, where the meat is all sourced from local suppliers. Citrus-marinated duck leg, for example, from Yarrow Meadows certified-organic farm, is densely fatty and charred on the edges, but not what most would expect from a Mexican restaurant. The small, messy portion is served on small, square, cast-iron pans with no embellishment save for a side of creamy guacamole and dark, smoky salsa. It's great meat, but it's just meat – a little bland and not what many would expect. The kitchen doesn't have freezers, so the main fish dish is whole rockfish served Spanish-style with capers, olives and tomatoes in a mild-chili broth. I'm sure it's great, or at least better than the cornmeal-crusted tostaditas, which are ploddingly dry with their sparse sprinkling of jalapeno vinaigrette. Rajas con crema is advertised as creamy, but it's actually more corn-y and not exactly satisfying for those wanting thick heft. As with the enchiladas flor de Jamaica – dried-out tortillas filled with tart, rehydrated hibiscus flowers and crunchy slivered jicama – it's all a bit Spartan and restrained. The main ingredients are great, it's just the execution that's lacking. There is nothing inherently wrong with food that isn't immensely Instagrammable. But when sharing a plate of rockfish ceviche, I don't want to taste murky sludginess from too much charred pineapple that's been floundering in the citrus marinade. I'm sure the cool kids would agree that there is enough muck to be found on Tinder. Who needs that on the plate? And it's just sad when you order slow-roasted pulled chicken tinga de pollo tacos with house-made chorizo, but the guajillo salsa is missing and none of that smoky sausage can be detected on the plate. If the cool kids were looking for advice, I would suggest starting with sopa azteca, a very traditional soup usually swamped with stringy cheese, but here made exceptionally crisp and clean with a glistening clarified chicken broth. This is excellent soup. The soup would be followed by grilled Caesar salad. Yes, Caesar salad, which may sound odd, but was actually invented in Tijuana. This gluten-free version, adorned with crispy chile-dusted chicharron swirls instead of croutons, in lightly charred-lemon vinaigrette, is delightfully light. 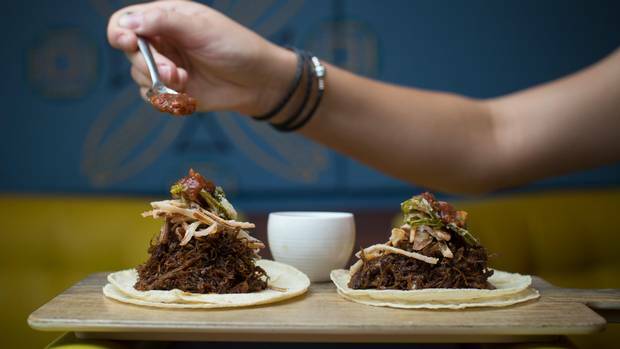 Finish it up with braised beef-cheek tacos that are creamily braised in peanut butter, spiked with coffee, chili and crispy shallots. El Santo is a nice restaurant for New Westminster. I'm sure it will make the locals happy and that's really all it was intended to do. Would I call it a gold-medal-worthy destination? No. But apparently there are some big changes coming to the kitchen and bar, so it might live up to all the inflated hype yet.